Tired of being forced to be something you don't want to be? Think it's silly that a low-level mage with minimal weapon and armor skills can become leader of this famous band after only two weeks? No longer. Now you must truly earn your place among your Shield-Brothers and Sisters. Added a new conversation with Ria, after the main story questline ends, where, if you've been kind to her (asked for her advice at least once and thanked her for it), you can help her choose her fighting style (class skills and combat style). Added the ability to report failure for the "Animal Extermination" (beast den), "Family Heirloom" and "Rescue Mission" radiant quests given by Aela, Vilkas and Skjor. Added compatibility with the aMidianborn Content Add-On version of the Skyforge weapons. Also, Eorlund will now offer the Skyforge Warhammer and Mace as choices after the player's induction ceremony when an appropriate aMidianborn mod is installed. Added a little more unvoiced dialogue later in the questline, around "Purity of Revenge" and "Glory of the Dead," to address a few internal inconsistencies and allow the PC to ask a few questions that begged to be asked. Added a toggle in the MCM to allow magic in sparring, including in Open Circle. Added compatibility with the Dawn of Whiterun mod for the Open Circle quest. Added some additional debugging info to the Troubleshooting page of the MCM. Merged in relevant Companions-related fixes from the Unofficial Skyrim Patch 2.1.2. Some new content: a short conversation with Tilma and a small note in Farkas's room. For "Trouble in Skyrim" you can now report back to Farkas that you're unable to complete the quest, if it's too difficult for you. As a penalty, you'll need to do a few extra quests. In the opening fight with the giant outside Whiterun, the giant will now be invulnerable the first few seconds of the fight, to give the player more time to get there. Changed "The Silver Hand" quest, so that when you find Skjor at the end he will now be in beast form to better explain the lack of public resolution of the quest's ending. Also there will be more evidence of his passage through Gallows Rock. Fixed a vanilla issue where if you did not have access to a witch head for a brothers's "Purity" quest, the brother could be left unable to offer any radiant quests after "Glory of the Dead." Fixed a potential exploit in the "Open Circle" quest: the player will now only be essential during the actual fight, not throughout the quest. Fixed a disparity in the sparring system where if you had given your opponent health potions (e.g., if they were your follower), they would use them, although you can't use your own potions. Sparring should no longer re-enable fast travel after the match if another mod had previously disabled it. 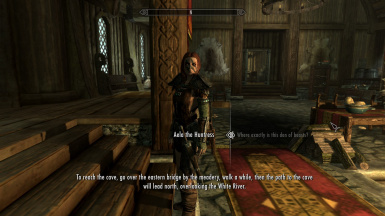 Fixed a bug in the quest where Aela regifts the beast blood that can have Aela rejecting your request even if you passed the necessary Speech skill check. Fixed some vanilla dialogue quirks: Skjor could commend the PC for "another job well done" after the PC finished their very first job; Athis would call a female dark elf PC "brother"; Skjor could say he had never seen the PC before, after talking to them. Added the vanilla "PerkSkillBoosts" and "AlchemySkillBoosts" perks to all Companions, to enable them to take full advantage of fortify combat skill enchantments as followers. Improved the MCM troubleshooter function to cycle a new batch of radiant quests. Tweaked the end of "Glory of the Dead" so that the objective to ask the Companions for more work will now only appear after they've returned to Jorrvaskr and have work available. Removed a few unnecessary .pex files that I had packaged with the previous update by mistake. Merged in other Companions-related fixes from the Unofficial Skyrim Patch 2.0.4a. Fixed a bug where Farkas's "Hired Muscle" quest was being selected less frequently than intended. Made the whelps essential until after the "Open Circle" quest to prevent issues with that quest. Added new custom perks for Aela that increase her attack speed when using daggers or bows, as well as a damage bonus with daggers--to try to get her into the same league, combat-wise, as the other members of the Circle. Fixed an issue where Aela's Pelt Collection and Totems of Hircine quests were being selected less frequently than intended. For both, there are 4-day delays upon completion before they re-enter the normal random rotation of quests. Fixed a vanilla issue where Aela's Totems of Hircine quests were set to use only uncleared locations, causing the quests to fail to start in late-game situations where no uncleared locations remained available. Fixed a bug where setting the skills of a Companion (their class) in the MCM was not persisting across gaming sessions. Reduced issues with Athis's armor becoming invisible for new users of the mod, and for upgraders coming from version 0.3.1 and below. 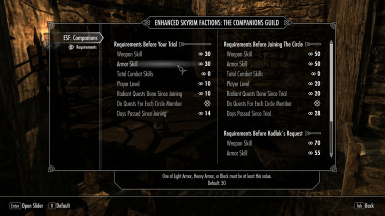 Fixed a logical flaw where installing another mod that modifies the C00 Companions quest lower in a load order after having already played with ESFC installed would have eliminated the requirements and reset the quest progression system. Allow players to circumvent the follower/teammate check when sparring to accomodate mods that use invisible teammates around the PC for other purposes and the UFO mod. Made all Companions have "Foolhardy" confidence so they won't run away when fighting. Assigned specific combat styles to Companions who had just been using the default combat style, as per Bethesda recommendations. Scaled back the perks on the whelps, and boosted the perks on the Circle members, to better reflect the superiority of the Circle. Various stat and gear changes for the Companions. Added an MCM option to prevent vampires from joining; the stage of vampirism that will trigger this rejection is configurable. Added a toggle in the MCM to let Aela, Farkas and Vilkas give new radiant quests while they are your current follower, unlike in the vanilla game. Note that this does not include their special quests--Dragon Slayers, Purity, and the Totems of Hircine. Fixed a bug where the MCM option to configure the Speech skill needed for Thieves Guild members to join the Companions was not working correctly. 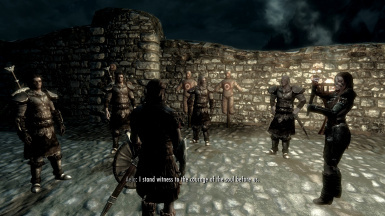 Fixed a bug where Circle members could say their scheduled training instructions even when they were far away from Jorrvaskr. Fixed a bug where Companions could wander randomly around Whiterun in some circumstances. Fixed a bug in the "Open Circle" quest where setting your partner as invulnerable was never undone. Fixed a vanilla issue where non-following members of the Circle could turn hostile if they saw the player take beast form. Fixed a vanilla issue where Aela's Silver Hand quests were set to use only uncleared locations, causing the quests to fail to start in late-game situations where no uncleared locations remained available. Fixed a vanilla issue where being asked to intimidate the same NPC a second time could result in no dialogue being available to initiate the brawl. Restored a few extra voiced lines to Aela during the Totems of Hircine quests that aren't played in the vanilla game due to some logic errors: she now will make different comments after you find each of the three Totems, as originally intended. Restored a voiced line of commentary from your Observer during your Trial that was not playing due to a logic error in the vanilla script. Added back in Aela's pelt collection quest after I disabled it by mistake in 0.3.1. Also added the ability to ask her how many pelts are needed before accepting the quest. Added a new (brief) unvoiced conversation with Farkas if he was your Trial Observer, available after "Proving Honor" is completed. Added some improvements to Aela's conversation during "Blood's Honor" to better account for game lore. Tweaked "Glory of the Dead": members of the Circle will only become available as followers after they return to Jorrvaskr from Ysgramor's Tomb, to be consistent with their dialogue about wanting to stay there for a bit. Tweaked "Glory of the Dead": the player's dialogue in the Tomb with Aela was adjusted to make (a little) more sense. Added checks with sparring to ensure players don't start sparring matches with their current follower (which doesn't work), or have followers with them when they start sparring someone else (which causes the follower to also attack your opponent). Added ally and friendship relationship data between the Companions where appropriate. Merged in Companions-related fixes from the Unofficial Skyrim Patch 2.0a. Improved interoperability with the Moonlight Tales/Werewolf Mastery combination of mods. The "Purity" quest for Farkas will now only trigger if the PC doesn't have beastblood (this will be expanded on in future updates). Improved Kodlak's introductory conversation for mages. Fixed a bug in 0.3 where Njada, Athis, and Aela did not respond to the "offer training only in yard" MCM setting. Fixed a bug in 0.3 where you could ask Kodlak where Kodlak was. Fixed a bug in 0.3 where you could get Kodlak to spar with you if you asked twice. Cleaned a few wild edits introduced in 0.3. Merged in most Companions-related fixes from the Unofficial Skyrim Patch 1.3.3 (note I intentionally override the USKP change that allows Tilma to sleep). A few other tweaks and fixes--typos, missing silent audio files, etc. Added a new ceremony where you are officially and publicly inducted into the Circle. You'll be prompted to talk to Kodlak when the time comes. Added the ability to decline Skjor and Aela's offer later in the Underforge. Added an MCM configuration menu for SkyUI4+SKSE users. This adds several new configuration options. Added more lively schedules for the Companions in and around Jorrvaskr; they now train and eat together, etc. 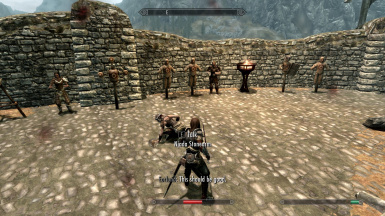 Added the ability to spar with the Companions when around Jorrvaskr after you join. Added to Skjor a selection of perks and a 1.25x player level multiplier--this is to try to make him a challenging sparring partner. For Aela's "Animal Extermination" radiant quests, she can now sometimes tell you what kind of beast you'll be facing before you accept the quest. She can also tell you in advance where the quest location is. Added a new random world event where you may be attacked by the Silver Hand after the "Proving Honor" quest. Merged in bug fixes from the Unofficial Skyrim Patch 1.3.2 for Companions quests also modified by ESFC. Merged in improved Companions quest journal entries and objectives from the Even Better Quest Objectives mod, with my own tweaks and additions. Fixed a bug with ESFC 0.2.x that could prevent the Totems of Hircine quests from being available. Fixed a bug with ESFC 0.2.x that was spawning animal pelts inside Jorrvaskr. Suppressed some scenes after the Silver Hand quest that suggest Skjor is still in charge of day-to-day activities. Added the ability to temper Aela's custom light Ancient Nord Armor. Added a little more health to the giant outside Whiterun, which should give players a more fair chance to reach it. Added a way for non-Dawnguard players to regain the Blessing from Aela. Added more (silent) dialogue in a few places; try asking Kodlak about his condition, for example. Re-cleaned the mod in the latest TES5Edit. Cleaned the mod in TES5Edit. Generated a SEQ file to avoid the load-save-reload dialogue bug. Corrected an error in the efcsettings bat file (the descriptions for armor and weapon requirements were swapped). Merge fixes from the Unofficial Skyrim Patch 1.2.4 for quests also modified by ESFC. Added Update.esm as a dependency in order to incorporate its Companions fixes. Added a few missing silent voice sound files so that lines display for their proper amount of time. Added a bit of silent dialogue to the introductory conversation with Aela after the giant fight for more roleplaying choices. Built using latest Creation Kit so Skyrim 1.8 is now required. Added a radiant animal pelt collection quest to Aela. If you have done more radiant quests for Aela than any other Companion at the time of your Trial, it will be she rather than Farkas who is sent with you as your Observer during your Trial. Added some unvoiced dialogue in various places for better roleplaying and atmosphere. Added the option to block characters who have already joined the Thieves Guild or the Dark Brotherhood from joining the Companions. Extended the time Aela mourns at the end of the "Silver Hand" quest, giving the player a day or two to discuss Skjor with the other Companions. Radiant quests for Vilkas and Skjor will now only become available after you've done a few quests for Farkas and Aela, to match Farkas's dialogue during the tour he gives you. Added the dialogue option to decline the "Rescue Mission" radiant quest (CR08) given by Skjor and Vilkas. In the vanilla game the player must have visited a hold in order to be assigned Companions radiant quests there. Holds are now gradually unlocked over time. Once you join the Circle, the miscellaneous radiant quest objective will now read "Talk to the other members of the Circle for work." Added a custom class for Farkas to match his skills and gear. Gave Farkas some wolf armor, to fit the dialogue during the player's Trial. Slightly increased Farkas's height and weight, to give him a bit more visual personality and distinctiveness from his brother. 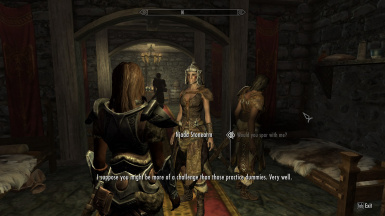 Changed Aela's Ancient Nord Armor and her Shield from Heavy Armor to Light Armor, to match her default skills. Added a custom class for Aela to avoid snafus with the Unofficial Skyrim Patch after it changed her class's armor specialty to heavy armor. Changed the maximum level of Farkas, Vilkas, and Aela to 81, up from 50. Gave them each a few low- and mid-level perks. Added a bat file with all configuration options for easier configuration changes. Added SkyUI MCM configuration panel for changing requirements; needs SkyUI 3.1 and SKSE 1.6.6 or above. Added esfcsettings bat file for easier configuration when not using SkyUI. Fixed issue where quest requirements needed to be set to one fewer than the intended value to function correctly. Adds skill, level, and time requirements for each of the Companions milestone story quests. 1. Increase the number of radiant quests required to advance in the guild, and add skill, level, and time requirements for each of the guild's milestone story quests (status: done). 2. Add new choices and consequences to those milestone quests (status: in-progress, one major new choice added to the scene with Skjor and Aela in the Underforge). 3. Add new radiant and story quests, both during and after the vanilla questline (status: in-progress, one radiant quest added). 4. Miscellaneous other improvements (status: in-progress, many tweaks made, see changelog). The Requirements Only version simply increases the number of radiant quests required between "story" quests in the guild questline, and adds skill, level, and time requirements as well. These requirements are all configurable via a SkyUI MCM panel, an included bat file, or console commands. The Full version of the mod has those requirements and also adds new choices and consequences, expanded activity schedules around Jorrvaskr, various tweaks to the Companions NPCs and quests, and new (silent) dialogue, all to enhance the feeling of being a part of this fellowship of warriors. In general this page describes the Full version of the mod; to use the Requirements Only version, download it and consult the ReadMe file in the download. The events surrounding a promotion that occurs mid-questline have been significantly overhauled, with a key new choice available to the player during a discussion with Skjor and Aela in the Underforge. - At least 8 radiant quests done since "Proving Honor"
- At least 6 radiant quests done since "The Silver Hand"
- You will need to do 2 radiant quests for Aela and Farkas before the radiant quests for Vilkas and Skjor will unlock. - Members of the Thieves Guild cannot join the Companions; members of the Dark Brotherhood need at least 60 Speech to join. - Former criminals who once accumulated a large bounty will be unable to join without at least 60 Speech. - Vampires who are currently past stage 1 will be recognized for what they are and barred from joining until they cure themselves. All of these can be altered via the SkyUI MCM. 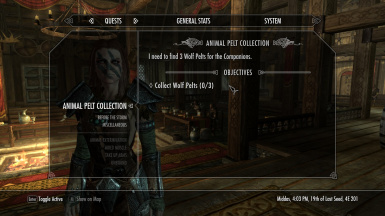 - Added a radiant animal pelt collection quest to Aela (this was existing content cut from the game, that I have lightly tweaked and restored). - If you have done more radiant quests for Aela than any other Companion at the time of your Trial, it will be she rather than Farkas who is sent with you as your Observer during your Trial (again, this uses existing voice files and scripting cut from the vanilla game). - Various changes to the Companions to better align their class skills, gear, combat styles and perks with their personalities. See the full list of changes in the "Article" section here on the Nexus. - Rather than just loafing around all day, Companions now have detailed training schedules. - Companions will spar with you in the training yard, after you've joined. - The Wolf Armor worn by the Circle will not be available for purchase from Eorlund until you have actually joined the Circle. - The reward gold for Companions radiant quests can now be configured via the MCM. - Added some (unvoiced) dialogue in various places for better roleplaying and atmosphere. 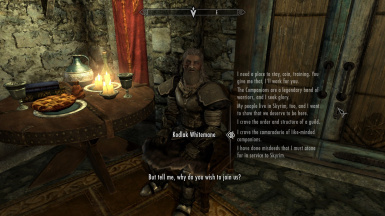 Kodlak will talk a bit more when you first join, Ria can follow up on her promise to show you the ropes, Vilkas will follow up on his suggestion that you come to him with questions, Skjor will warn you to dismiss followers before beginning your Trial, etc. - Extended the time Aela mourns at the end of the "Silver Hand" quest, giving the player a day or two to discuss Skjor with the other Companions. Also, she will now not offer her next quest until she is back at Jorrvaskr. - Aela, Farkas and Vilkas can now give new radiant quests while they are your current follower (must be enabled through the MCM). 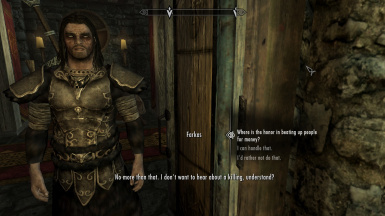 - Farkas will not initiate his "Purity" quest if the player has not "cured" themselves. - Other smaller tweaks, see the changelog for a full list. You must be using Skyrim version 1.9 or above to use this mod; the game version number is displayed in-game when you view your Journal. I also highly recommend using SkyUI 4.1 and above to enable using the MCM system to configure this mod's options. The mod adds a substantial amount of silent (unvoiced) dialogue, so you will need both dialogue and general subtitles turned on (in the game's Settings > Display menu), or use SKSE and the Fuz Ro D'Oh plugin, which displays subtitles only for unvoiced dialogue. If you can't stand silent dialogue, use the Requirements Only version of this mod. The mod can be installed into an existing game--it does not need a new game, although see the list of Known Issues below regarding a minor issue. For obvious reasons it works best when installed before you join the Companions. To install after you've already joined the Companions, the most likely safe points would be while you're in Dustman's Cairn or Gallows Rock but before you kill the bosses in those locations. No guarantees, though. Upgraders, see below. Note that version 0.3 is a large and complex expansion, so you are advised to save frequently and keep a history of such saves rather than overwriting them as you play through the mod. And if you're installing this into an existing game, you should always keep at least one save game from before you installed, that you can revert back to in case of any problems. This mod makes a number of changes to the Companions guild, and as such it may not play well with other mods that edit the guild's quests, characters, and locations. It does work with the Unofficial Skyrim Patch, and is designed to be used as a precursor to my ESF: Aela follower mod, but neither is required. 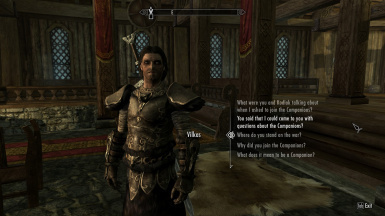 Live Another Life is compatible; if you elect to start as a Companion, note that Vilkas has a few lines of dialogue based on you having overheard he and Kodlak speaking when you asked to join, so just imagine that happened. A patch is available in the Files tab for Open Cities Skyrim. A patch for Requiem 1.9.3 is available here. Better Jorrvaskr or other mods that add clutter to the Jorvaskr training yard are not supported and likely not compatible. 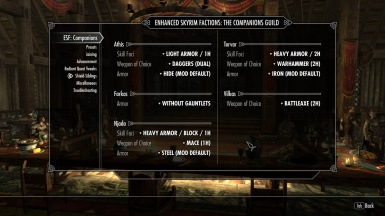 Complete Skyforge Kit AKA Skyrim Smithing is not compatible: it includes edits that break the Companions questline in both its vanilla form and with this mod. Do not use mod-added map markers for Jorrvaskr to return after completing quests during the Companions questline. The Increased Bounty and Guild Rewards mod causes quest-breaking problems because of the loose scripts it uses. Make sure ESFCompanions.esp is lower than it in your load order, and then manually remove the 14 files named QF_CR01_blahblah.pex through QF_CR14_blahblah.pex that it added to the Data/Scripts directory. You can use the MCM in this mod to configure radiant quest reward gold for the Companions in place of that mod. Better Followers isn't recommended--it's been abandoned by its creator and left untouched for more than a year--but if you insist on using it, put my mod below it, and delete the C01QuestScript.pex that it tries to add to the Scripts directory. Moonlight Tales is compatible, with or without the Werewolf Mastery mod alongside it. If you use Moonlight Tales alone, place it above ESFCompanions.esp in your load order and delete the C01QuestScript.pex file that MT adds to the Data/Scripts directory. (Newer versions of MT no longer include this file, so if you can't find it, don't worry about it.) If you use Werewolf Mastery with MT, place WerewolfMastery.esp below ESFCompanions.esp (and you should not delete C01QuestScript.pex). 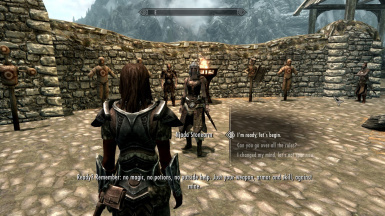 When you come to the Open Circle quest, you should either 1) temporarily disable Aela, Farkas and Vilkas from being managed by Moonlight Tales or 2) choose someone other than your Trial Observer to fight with you. Otherwise your Observer will transform during the melee, and their magical attacks will leave you unable to advance. Even Better Quest Objectives is compatible but should be positioned above this mod in your load order, as ESFC version 0.3 includes its own updated objectives based on EBQO for the Companions quests. EBQO patches made for use with version 0.2.1 of ESFC should not be used with version 0.3. 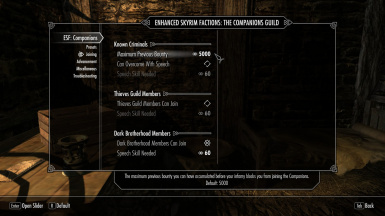 Users of UFO - Ultimate Follower Overhaul should make sure ESFCompanions.esp is below that mod in their load order, so that my changes to the Companion NPCs will have priority. The current stable release of UFO may also cause the sparring system to falsely report that you have someone following you because of a bug; a fix for UFO is being worked on. ESFCompanions.esp should be loaded below the .esp for aMidianborn Skyforge Weapons/Content Addon for best results. Likewise load ESFCompanions.esp below Cutting Room Floor. If you encounter compatibility issues you can also try the Requirements Only version of this mod, which includes only the requirements component. That version should be highly compatible with all other mods, as it does not edit any default Skyrim scripts, quests, locations, or characters. This mod is packaged in an archive compatible with Wrye Bash's BAIN installation method and with the Nexus Mod Manager. To install manually, extract ESFCompanions.esp and ESFCompanions.bsa from the archive with 7zip or a compatible program and place them into your game's Data directory. For most users this will be something like C:/Program Files (x86)/Steam/steamapps/common/skyrim/Data (although if it is, you may want to read up on moving Steam out of the Program Files directory to avoid permissions problems). Once installed and set to the proper place in your load order, just activate ESFCompanions.esp in your launcher and play. To upgrade from 0.3 and above, just replace the old ESFCompanions.esp and ESFCompanions.bsa files with the new ones and keep playing. If you're in a location with any of the Companions, you may need to leave and then re-enter for their outfit changes to take effect. You may also need to disable/enable Athis via the console if his armor disappears. If upgrading from the Version 0.1.1, the Requirements Only version, you will need to 1) make a save game, 2) exit Skyrim, 3) deactivate the mod and remove its ESFCompanions.esp and ESFCompanions.bsa files, 4) start Skyrim again, 5) load the save you made, 6) wait 60 seconds, 7) make another save, 8) exit Skyrim, and 9) then install the full version. If you had customized the requirements, you will need to do so again. Sorry about that. Bethesda's official stance is that uninstalling mods is not possible with Skyrim. This is because information from a loaded mod is permanently added into any saved games made with that mod loaded, and persists thereafter. Make sure you keep a save game from before you installed this mod, that you can revert to in case of any problems or dissatisfaction. I can't get one of the Companions quests to work! Because this mod encompasses the whole Companions questline, it's tempting to see it as the cause of any problems with that questline; but the reality is that the vanilla questline has many bugs, and most issues people report have nothing to do with this mod. That doesn't mean this mod is perfect--see below--but before reporting a problem, 1) consult the uesp.net page for the quest you're having trouble with to see if your problem is a known bug, and if there is a known solution; 2) use the Unofficial Skyrim Patch, it fixes many bugs and is updated more frequently than this mod; and 3) be wary of mods that add fast-travel markers to Whiterun (never fast-travel directly to Jorrvaskr to conclude a quest), or make other edits to the city, because many Companions quests require passing through a certain trigger or location-change. 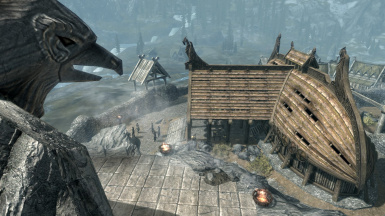 I've never had problems with fast-traveling to Dragonsreach on my way back from quests during testing, but if that doesn't work and you must fast travel, go to the Stables outside town and then run the rest of the way back. One of the Companions is naked! The game sometimes fails to update the rendering of characters after outfit changes--they think they're wearing their armor, but you can't see it. What usually fixes this is opening the console with the NPC on-screen, clicking the NPC to select them (their ID will appear in the middle of the screen), and then enter the command "disable" followed by "enable". This forces the game to update the NPC's 3D rendering. 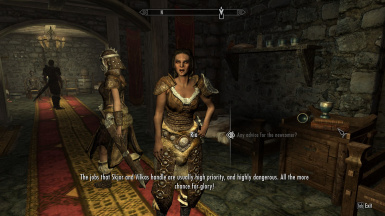 For Athis, you can also use the "Shield-Siblings" section of the MCM to toggle his outfit to a different choice, then back to whichever you want; for Aela and Farkas, there is also a section in the "Troubleshooting" area of the MCM menu that can help. When I try to talk to the Companions, they have their weapons drawn and won't talk to me! See the first question. That's a vanilla issue--it means you have an unpaid Whiterun bounty. The Companions are members of the Whiterun guard faction, and react accordingly. Will the Companions care if I join the Thieves Guild/join the Dark Brotherhood/become a vampire after Kodlak has already accepted me as a Companion? Currently, they won't care. In future updates they will care if you are *caught* doing something criminal, or are wearing TG/DB faction armor when you talk with them. But they won't automatically know about your other guild affiliations or activities. Are you going to do this same sort of thing for the other guilds? It's a reasonable question given my grandiose mod title, but nope, I'll leave the other factions to other modders. I only have so much time for modding, so I'd rather focus my efforts and do a good job for just one faction, not a half-baked job for all the factions. If you like the sort of dialogue I add in this mod, I'd encourage you to have a look at my Enhanced Skyrim Followers: Aela the Huntress follower expansion; this mod was only begun as a prelude to that. Beyond the Companions, there are plenty of mods that try to enhance the other guilds, such as Thieves Guild Requirements & Localized Thieves Guild Jobs for the Thieves Guild, and College of Winterhold Entrance Requirements & Missing Apprentices & Research Thief & Archmage Tolfdir for the Mage's College. Can you make it so I can refuse the title that Kodlak bestows on me? It's certainly an idea I've had, although I doubt it'll ever happen. Kodlak's journal explains part of the reason why not, and also I don't imagine the others would feel comfortable dishonoring his memory by going against his last request. 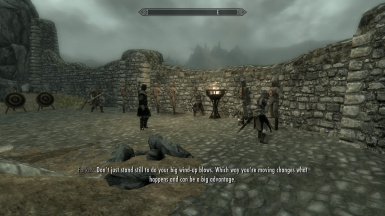 Vilkas accusing you of using magic is a vanilla issue when you use a mod that puts a hidden "cloak" spell on the PC in order to detect nearby NPCs. The cloak hits the NPCs, and they perceive that magic is being used against them. Lots of mods do this--everything from combat mods, to mods like Footprints and Player Headtracking--and the problem will also happen with other quests that involve non-lethal fighting, like brawling. The problem is that in brawling or sparring, magic cast by the player on NPCs isn't allowed. Some mods like Wet & Cold allow you to turn their cloak effect off temporarily, and there is also a mod called Brawl Bugs Patch that is supposed to fix the problem. Kodlak never gives the signal to begin the fight in "Open Circle"! I'm trying to spar with someone and they tell me to have my "friend" wait inside--but I don't have any followers with me! Certain mods may make ingenious use of invisible player teammates for various utility functions; also, the popular UFO follower overhaul has a bug where it forgets to unset dismissed followers as teammates. Just tell your sparring opponent that they're mistaken, and you can begin sparring. Aela said she cleared out Gallows Rock, but they're almost all still alive! Against the training dummies, some of the Companions get stuck and won't attack! Stupid AI is stupid. I've thought about moving the training dummies/targets around a bit, but have been trying to avoid editing them to avoid conflicts with other mods. As it is, this is random: it'll work fine on one day, someone will get stuck the next. They always un-stick themselves eventually. Some of the Silver Hand in "Blood's Honor" are labeled as ordinary bandits! This happens when you add either this mod and/or the Unofficial Skyrim Patch into a playthrough that was begun with neither. I think it's due to a USKP fix to avoid larger problems with that quest not starting. The Companions tend to all cluster together near the Jorrvaskr entrance! This is because of how the game engine only pays attention to NPCs near the player; it tends to "forget" what the Companions are supposed to be doing until the player character enters a cell adjacent to them, at which time it teleports them to the nearest spawn marker. In other words, there's nothing wrong, and nothing you or I can do about it. Just give them a few seconds and they should take up their usual schedules. If you have problems, suggestions, or questions about the mod, the best way to get in touch is via the discussion tab for the mod on the Nexus or the thread for the mod in the Skyrim Mods area on the Bethesda Forum. As of this writing, the current thread for the mod is here. You can also send me private messages as DreamKing (preferred) on the Bethesda Forum, or on the Nexus Forums as DreamKingMods. Please don't send support inquiries, though; you'll get better and faster help posting to the forums, since other people may be able to help you. Use of this mod may lead to broken quests, corrupt or bloated save games, and other issues. Make sure you keep a save game from before you installed this mod, than you can revert to in case of any problems. In part or in whole, you may not upload, re-host, or otherwise make this mod or an edited version you derive from it available at any other location under any circumstances without my express permission, except as specified here. If you downloaded this mod from an unauthorized location, be advised that there may be newer versions of the mod available with important fixes and additions posted on authorized sites, that you will not benefit from. If I do not respond to attempts to contact me via the methods listed in the "Contact" section of the latest release of this mod for 6 months, and have not given prior notice of planned absence, then consider this mod and its assets released to the community. Thanks to the users of the mod for their enthusiasm, and to MPBunny and deadarmour for their ideas. Thanks to whickus and William Imm for allowing me to include the improved quest objectives relating to the Companions quests from their excellent Even Better Quest Objectives mod, and for William Imm for creating patches to ease compatibility with ESFC and several other mods. Thanks to the Unofficial Elder Scrolls Pages (http://www.uesp.net/) for being a frequent and valuable reference. Thanks to the Nexus Network (http://skyrim.nexusmods.com/) for providing a platform for mods and the community that exists around them. And of course credit and thanks go to Bethesda Softworks, for releasing and supporting modding tools for their games--without which this mod could not have been made.